This authentic 1950s jewelry features amazing art glass, decorative beads, imaginative color combinations, and textured metals. Single- and multi-strand necklaces, cluster earrings, pendant earrings, brooches, bracelets, and sets are included. 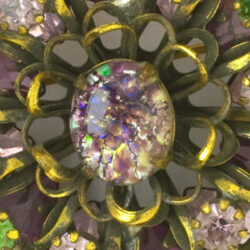 You will find fabulous fakes – imitations of large-scale fine jewelry – as well as graceful and classic tailored pieces. Gold-tone was more popular than silver-tone in this decade, when clothes that emphasized the female figure were in vogue. Another significant characteristic of the 1950s, other than the ubiquitous simple strand of pearls, was the preference for all accessories – jewels, gloves, handbags, shoes, and hats – to be color coordinated. 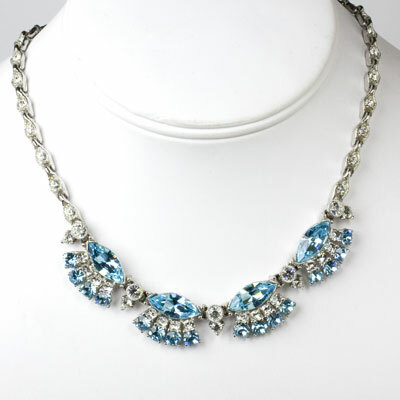 Read more about 1950s jewelry and fashion. These baroque pearl earrings have a large, cream-colored glass pearl center encircled by a ring of small, matching round pearls. 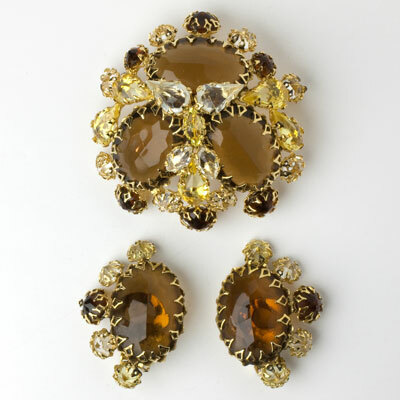 Though these 1950s earrings are unsigned, the construction (especially the ear-clip mechanism) and materials are consistent with those used by Louis Rousselet. (His pieces were usually only signed with paper hang tags.) These earrings would make a lovely accessory for daytime, evening, or bridal/wedding/prom wear. 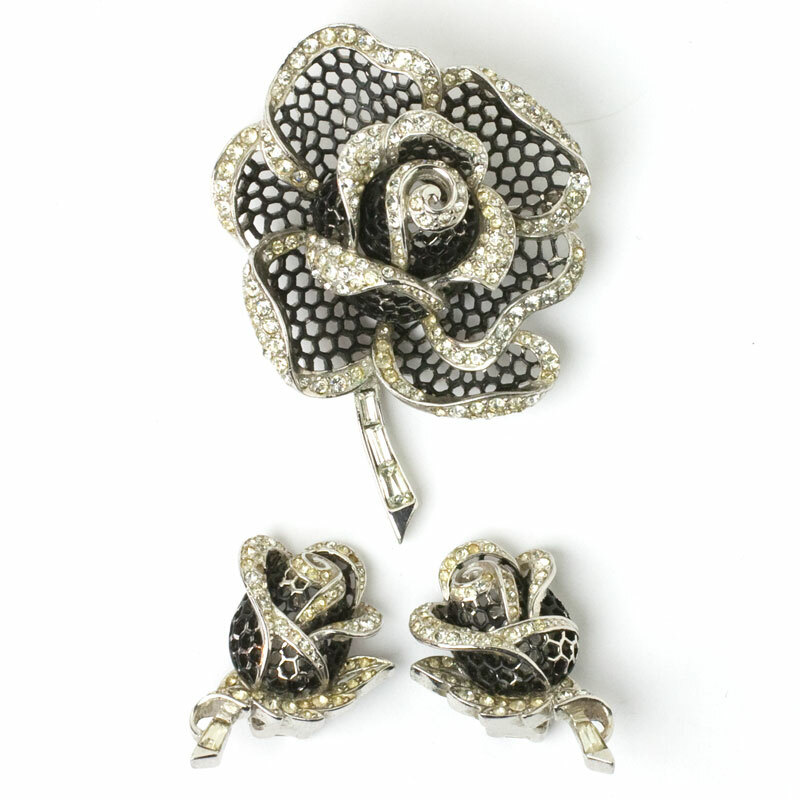 In this vintage rose brooch and earrings set, Boucher crafted a lovely three-dimensional flower in rhodium-plated metal with black enamel and round diamanté. The stem of the rose is adorned with baguettes. The brooch closes with a roll-over safety clasp. The ear clips are just as well-designed. This incredibly-detailed 1950s set deserves its elegant name: Rose of Seville. Wear the pieces together (in the style of the decade) or separately to make your outfit memorable. A perfect set for those who look best in cool colors. This enamel brooch with diamanté embellishments in a sterling silver setting was made by Ralph DeRosa in the 1950s. The detailed design is a fine example of this exceptional maker's work. 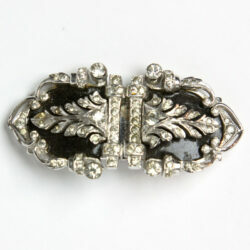 This piece can be worn as a single brooch or as separate dress clips. (The double-prong fastener works well with heavier fabrics, such as wool dresses or blazers.) The photos show a third option: one clip worn as a pendant on a sterling silver or white-gold chain (neither is included). I've used necklaces from my own jewelry box to show you how beautiful they look with the clip and how versatile this jewel is. I would wear faux or real diamond studs with this gorgeous piece. 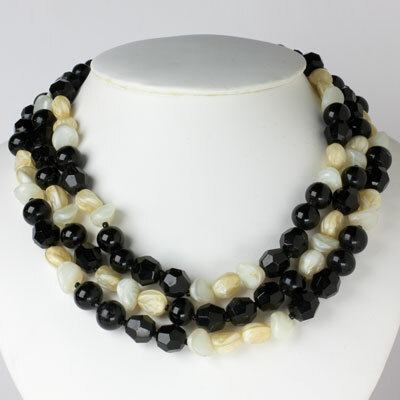 Smooth and faceted round black-glass beads are highlighted by marbled-white and cream beads shaped like pebbles in this elegant 1950s necklace by Hattie Carnegie. 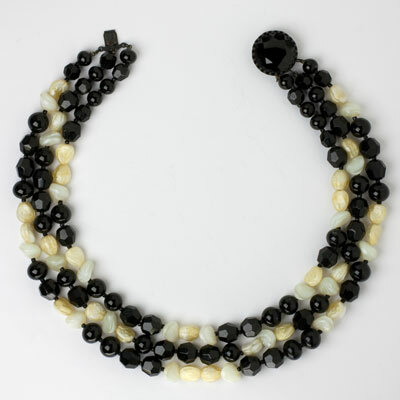 A large, round, faceted black-glass-bead-topped hidden clasp holds together the three strands. The color combination is versatile and timeless. Carnegie's glass beads were among the best! 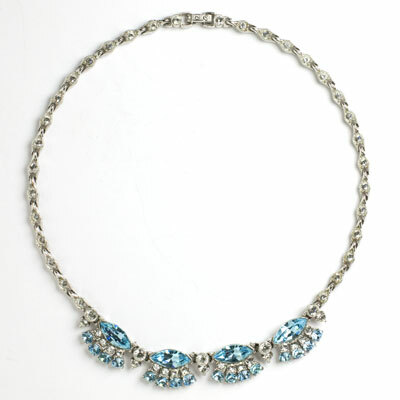 This necklace adds a beautiful and elegant collar to a round-neck garment. 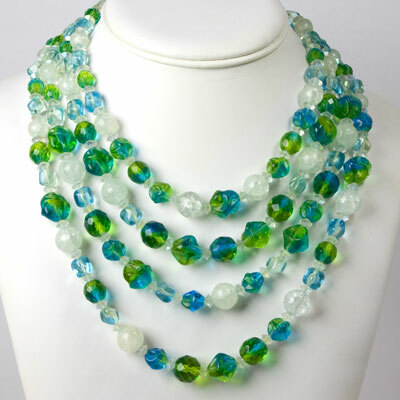 This 1950s necklace is another example of Hattie Carnegie's extraordinary flare with glass beads. Here, most are bi-color. 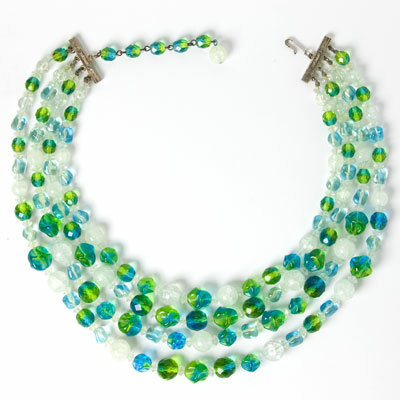 The shapes and sizes vary, and the predominant colors are interspersed with white and clear beads along with crystal spacers. Blue and green was a very popular color combination in the 1950s, and it still works well today. This necklace has substantial weight and an adjustable hook-and-tail clasp. 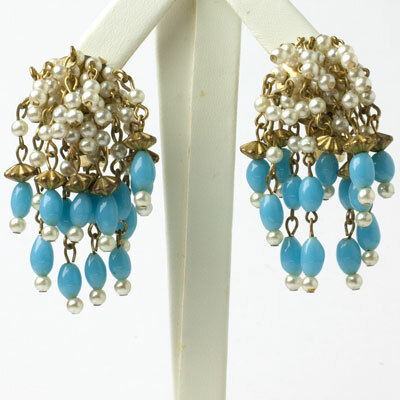 These Hobé earrings from the 1950s feature a cascade of tubular, opalescent, blue-glass beads, glass pearls and textured, gold-tone lantern beads. Set in gold-plated metal, these ear clips by the second generation of Hobé designers have lots of movement. Wear this pair with jeans or for a night on the town all year round. Clusters of blue glass beads in varying shapes, tones, sizes and finishes add dimension to these classic 1950s ear clips by Hattie Carnegie. A few of the beads are iridescent because of their aurora borealis coating. 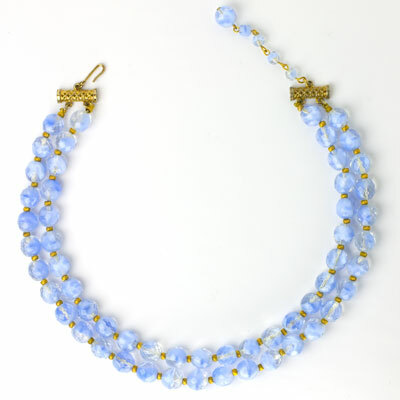 Scroll down to see the Blue Glass Bead 2-strand Choker by the same designer. Both pieces are perfect for women who look best in cool colors. 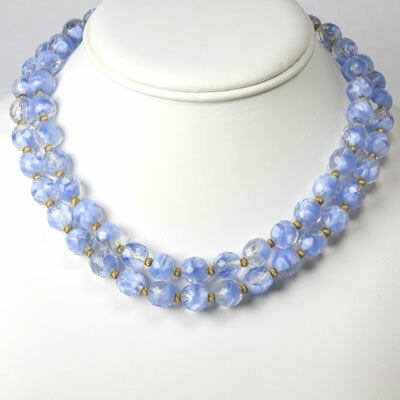 The glass beads in this 1950s 2-strand choker by Hattie Carnegie look like blue from a distance, but they are actually pale blue, white, and clear all in the same bead! In between the beads are twisted gold-tone spacers. The necklace has an adjustable hook-and-tail clasp. Scroll down to see a pair of Carnegie earrings that coordinates well with this piece. This 1950s bracelet by Elsa Schiaparelli features nine links of gold-plated metal scrolls. The larger links are each set with an open-back, faceted, emerald-cut brown-topaz glass stone, with pairs of diamanté accents on each side. 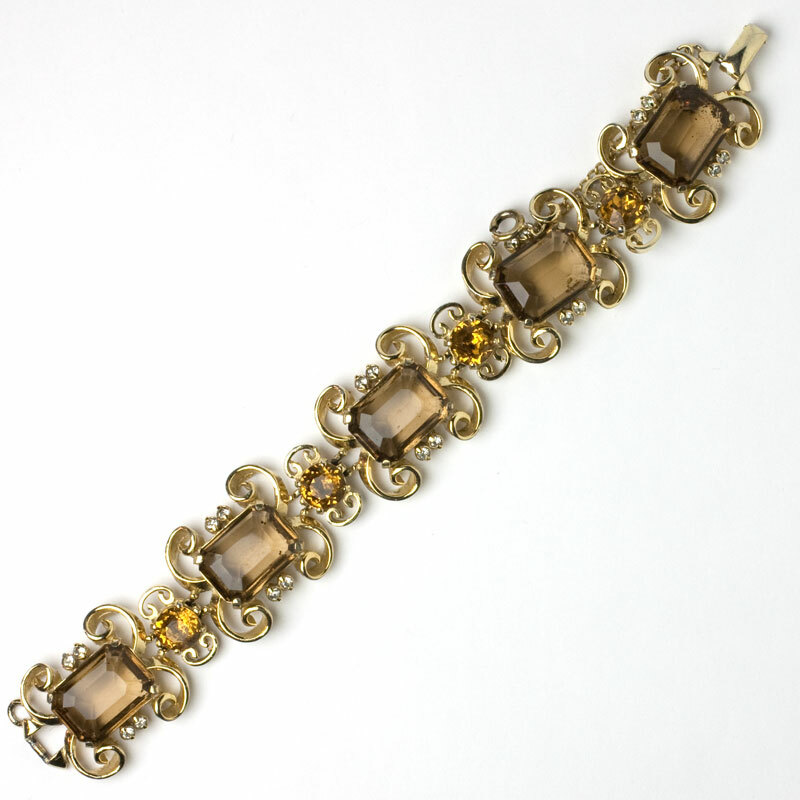 The smaller connecting links are each set with a faceted, round golden-topaz-glass stone. As usual with this maker's pieces, the design is finely detailed. Here, the scrolls are at the top and bottom of the large stones and at the sides of the smaller ones. This classic piece has a fold-over clasp with safety chain. The matching pendant earrings are available – scroll down to see them. 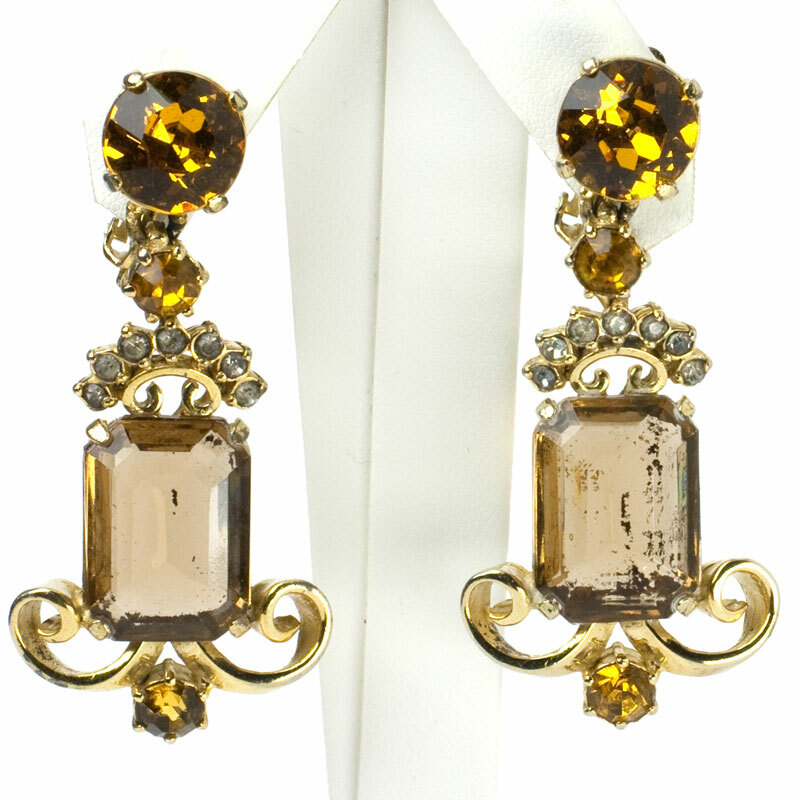 These brown and gold topaz earrings by Elsa Schiaparelli feature multiple stones in a gold-tone setting. At the top, a large, faceted, round golden-topaz-glass stone is positioned to adorn your earlobe. This stone is linked to a smaller, faceted, round brown-topaz-glass stone, which is connected to the setting of the pendant. This focal point – the pendant – is a large, faceted, open-back, brown-topaz-glass stone in an ornate setting. 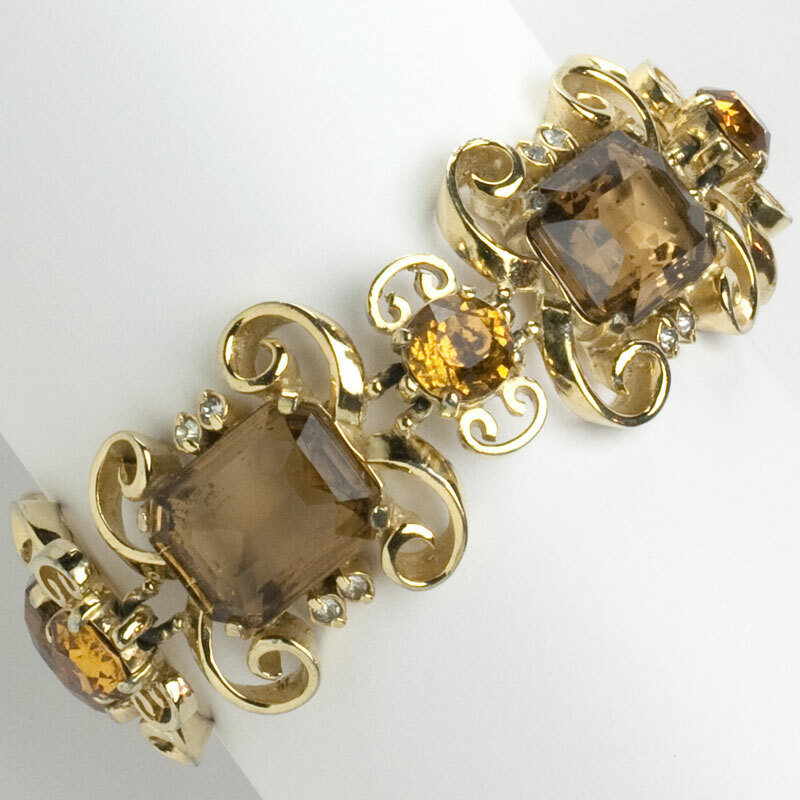 Its top is crowned with diamanté; the bottom rests on a scroll accented with another brown topaz. 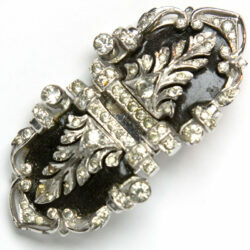 Please note that the dark striations in the large stones shown by my camera are not visible when the earrings are worn. Though not signed with the maker’s name, these ear clips are marked with the utility patent for one type of finding Schiaparelli used. The design of these pendants is undoubtedly hers – scroll down to see the matching signed bracelet. Both are perfect for those who look best in warm colors. This Shreiner brooch, the centerpiece of this 1950s set, features huge, multi-faceted, oval brown-topaz glass stones. 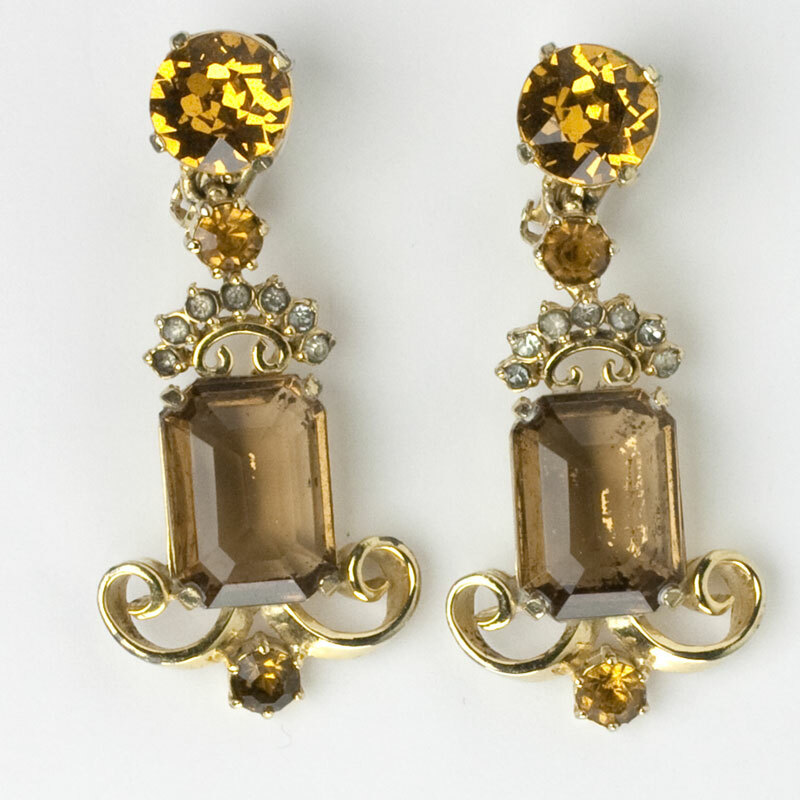 They are accented with layers of citrine and clear inverted glass stones, all in elaborate gold-tone settings. Even if the pieces weren't signed, the gorgeous glass, inverted stones, ornate settings, and donut-hole ear clips scream SCHREINER! This great color combination is stunning in any season. The earrings face each other, to frame your face. The dome-shaped brooch, which has a roll-over safety clasp, can also be worn as a pendant. The last photo shows that option on a black rubber cord, although you may prefer a gold chain. A 17-inch, 2mm black rubber cord with a stainless steel twist lock (just like the one in the photo) is included with this purchase. 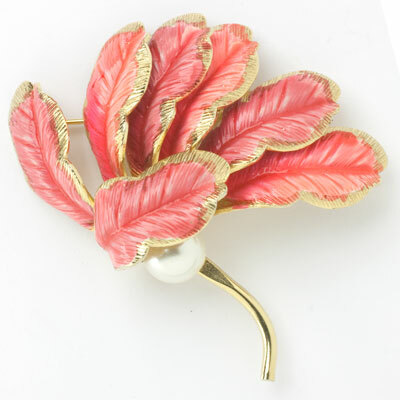 A richly-textured, gold-plated leaf forms the base of this lovely 1950s brooch by Elsa Schiaparelli. The top layer has citrine-glass-stone flowers with pavé silver-tone stems. The level of detail is superb: in addition to the elaborate, layered construction, the leaf has visible veins and a furled bottom on its front and texture on the back. This lovely example of 1950s tailored jewelry is a winner! I'm not sure which way it was intended to be worn, so I'm showing both orientations in the photos – take a look and decide which you prefer. These flower-shaped earrings feature a large, faceted, round citrine-glass bead that sits on a bed of textured, silver-tone metal leaves. They alternate with faceted, round citrine-glass stones in a deeper hue. This elegant, three-dimensional pair was designed by Frank Hess for Miriam Haskell. The French ear clips date them to the late-1940s or 1950s. Vibrant and easy to wear with casual, office, and evening attire, these earrings are timeless and unusual. This 1950s set by Alice Caviness features amazing layers of components wired onto a decorative brass frame. Included are citrine glass stones in multiple shapes and sizes, faceted golden-topaz beads, mother-of-pearl disks, aurora borealis diamanté, and textured brass leaves. The brooch is shaped like an oval wreath, with the jeweled frame mounted on another that holds the pin and roll-over safety clasp. Each earring has a jeweled frame mounted on a round filigree back with the ear clip. The complexity of the design and construction seen here are often present in this maker's work, which I believe is underrated. This set is definitely not for the faint-hearted! I will include the matching bracelet, which has only three of its four strands of beads, but it is definitely wearable. Scroll down to see a similar pair of earrings by the same maker. 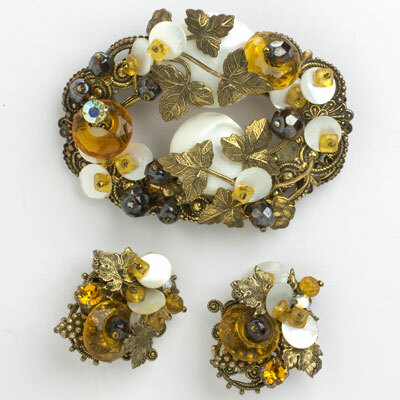 These 1950s ear clips by Alice Caviness feature layers of citrine and golden-topaz glass beads along with aurora borealis diamanté, mother-of-pearl disks, and textured brass leaves. These elements are wired onto a brass mesh back, which is mounted on a filigree scalloped-edged disk. This is the type of creation by this maker that leads me to say that she is under-rated. These earrings are just plain fun! Scroll down to see a similar pair of earring with matching brooch, also by Caviness. 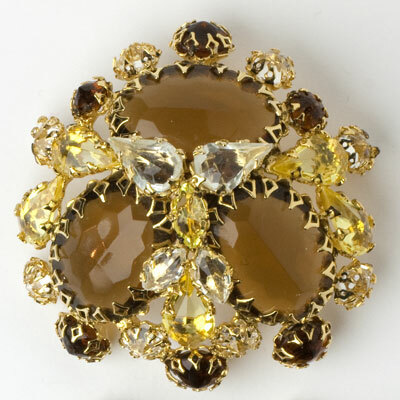 The focal point of this citrine brooch by Miriam Haskell is a luscious art glass stone that looks like melted caramel. 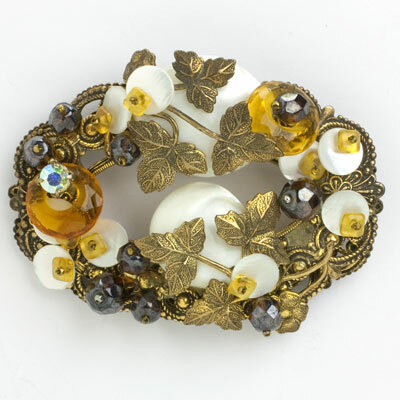 In true Frank Hess style, the rest of this 1950s piece is embellished with textured silver-tone beads and three golden topaz glass flowers. 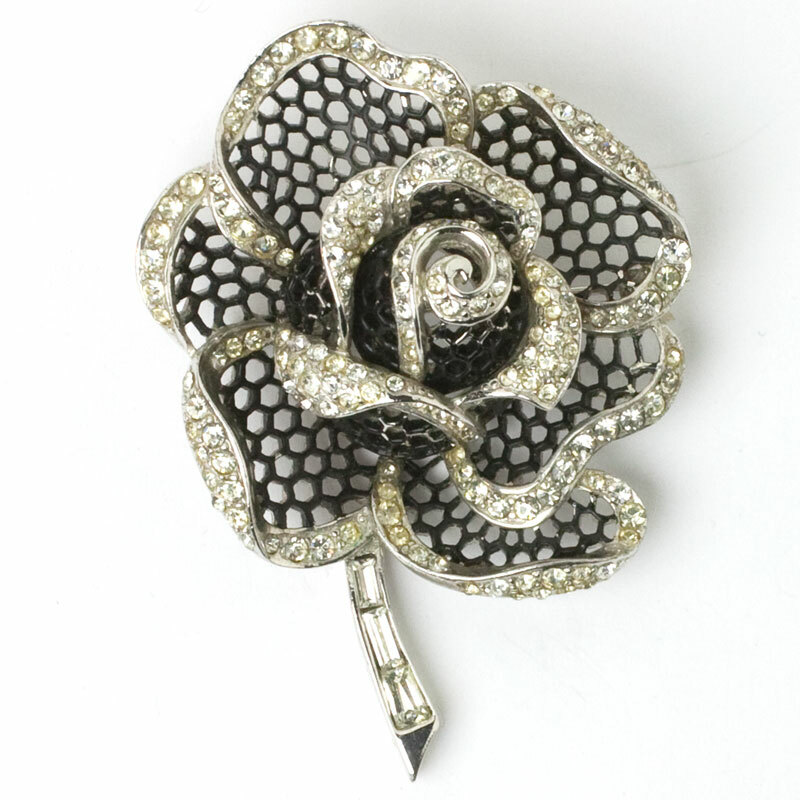 Rose montées complete the elements that are all woven onto a silver-tone filigree back. 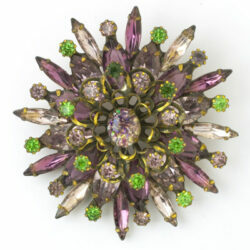 The size and shape make this brooch perfect for a collar, belt, hat, or purse. This Schiaparelli earrings and brooch set from the 1950s features a large citrine glass stone surrounded by tiny pearls in an elaborate, antiqued, gold-plated setting. Notice how the faceting of each citrine ― known as a dentelle ― forms an eight-pointed star design. Schiaparelli frequently used this cut of glass stone in her pieces. The pin has a roll-over safety clasp. You can see the utility patent for the ear clip here, below the names Frederick A. Ballou, Jr. & Rogers T. Stafford. 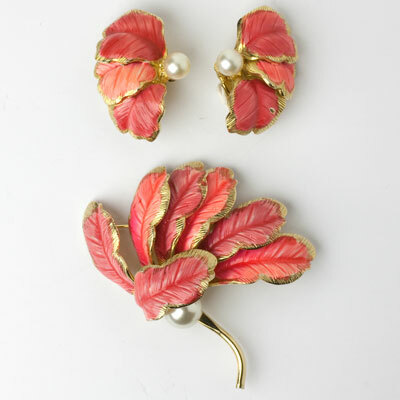 This 1950s brooch and ear clips set by Hattie Carnegie executes one of her common themes – florals – to perfection. 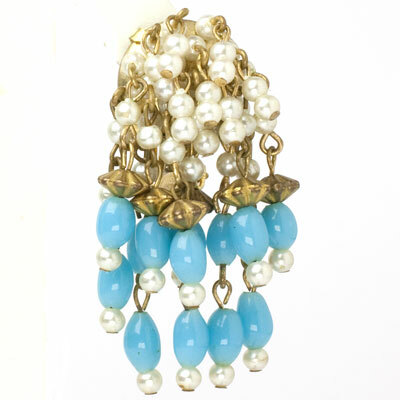 Each piece is made with coral enamel on gold-tone metal with a faux pearl accent. The design and detail are superb: the leaves look as though they're blowing in the breeze, and the backs of the brooch and ear clips show the leaves' veins. The brooch has a roll-over safety clasp. You could wear these pieces together or separately, for different looks. The brooch would also look great with simple pearl stud earrings. A perfect set for a woman who looks best in warm colors. 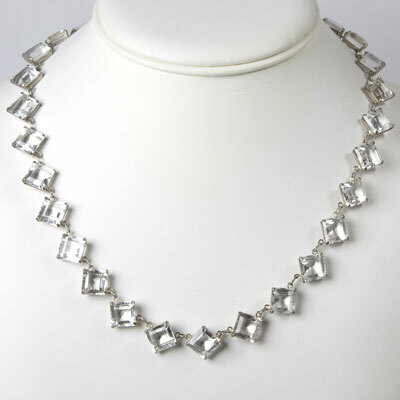 This sterling silver crystal necklace is a 1950s revival of the Art Deco chicklet. These faceted, square-cut crystals are set in angled frames, adding to the sparkle and uniqueness of this piece. 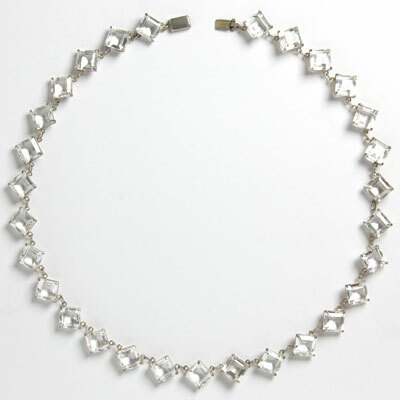 This necklace closes with a concealed clasp; its style tells me this piece was produced in Japan in the early 1950s. After the war, Japan produced a lot of high-quality costume jewelry for export. This beautiful necklace sparkled on the runway at Toronto Fashion Week for Spring 2019. Scroll down to see the stunning long chicklet earrings the model wore with this piece as well as other complementary jewels. This vintage rock crystal necklace and earrings set comes in its original box. (Rock crystal is a natural mineral.) Made in the 1950s, this set is reminiscent of similar pieces made in the Art Deco era. The necklace closes with a filigree fish-hook clasp. The original screw-backs on the earrings were converted to sterling silver ear wires with lever backs for pierced ears by my expert jeweler. The trademark ELCO may refer to Milglo Jewelry Co. These flower-shaped diamante earrings are much more beautiful than the photos convey. 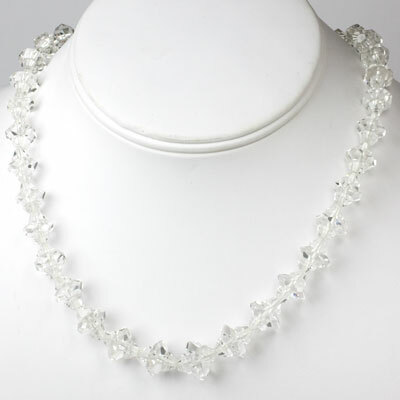 Six petals formed from tiny clear- and grey-glass bi-color beads wired together surround each large, faceted, round diamanté center. Designed by Frank Hess, this elegant pair features the style and workmanship that characterize Miriam Haskell pieces. The use of French ear clips dates these earrings to no earlier than the late-1940s, but I think the style is more 1950s. You can wear this pair for a special occasion or with everyday attire – they go with everything! They even sparkled on the runway at Toronto Fashion Week for Spring 2019!